We review new gaming desktops every week, each with its own quirks and eccentricities. For the most part, the internals in a lot of the top-of-the-line desktops are going to be remarkably similar. So, which one is the best gaming PC money can buy? When you’re buying a high-end gaming desktop, you should be on the lookout for more than just raw performance. Any machine in the same price category will be capable of hitting similar benchmarks. What you’re really looking for in a long-term solution is something with the right extra features, upgradability, and noise levels. You want a gaming desktop that reflects you and your needs, without compromising its horsepower. If you’re considering one with the latest and greatest graphics cards too, Nvidia’s new RTX-series graphics cards offer exciting new visual features like real-time ray tracing and deep learning super sampling (DLSS), as well as the typical generational performance enhancements of new GPU hardware. Why you should buy this: It has supreme power with whisper-quiet cooling. Who it’s for: Gamers who want awesome power in a chassis that’s easily upgradeable. Alienware might be a pricey brand, but what you get for your money is usually worth it. That’s certainly the case with the latest generation of Area-51 performance gaming machine, which has a unique looking chassis full of powerful hardware. With up to dual GTX 1080 Ti graphics cards and extreme Intel processors, there isn’t a game available today that will make this system whimper. If that does happen in the future though, the easy access you get with this system’s odd-ball case makes it a cinch to upgrade. It’s also incredibly robust, meaning if you do decide to lug this beast around – it is a little unwieldy – you can feel confident that everything inside will remain well protected even if banged or dropped. Perhaps the best feature of all, though, is how quiet it is. Most high-end gaming PCs whir away and encourage headphone usage from their owners. Not so with the Area 51, which looks, sounds, and plays better than just about anything we’ve ever tested. It’s not cheap, but you get your money’s worth with this top-tier gaming PC. If you’re willing to wait just a little longer too, Dell will be one of the first companies to support Nvidia’s new RTX-series graphics cards and the Area-51 R5 is no exception. Why you should buy this: You’re looking for something small, dense, and deceptively powerful (like a neutron star). Who it’s for: Gamers who want compact, understated power. The Falcon Northwest Tiki has been a firm favorite of ours for years and the 2018 version lives up to that pedigree. A compact powerhouse, the Tiki features powerful internal hardware hidden within a custom metal chassis. It’s a joy to behold, but we wouldn’t classify it as minimalist. Sure, it’s less flashy than many gaming rigs, but it’s still eye-catching, while being extremely economical with space. This thing is tiny. If Origin PCs are hot rods with racing stripes, the Tiki is a slick sports coupe with tinted windows and growling engine. Our review system combined an Intel Core i7 8700K with a GTX 1080 Ti graphics card and 32GB of RAM. More than enough to handle any game for the foreseeable future, although you can order one with an Nvidia RTX 2080 or 2080 Ti if you want the absolute latest and greatest. Thanks to revamped cooling and internal layout too, this Tiki is much quieter than its predecessors, and given how small it is, you could tuck this thing under your desk to muffle what fan noise there is. Why should you buy this: You want the best performance in the smallest form factor possible. Who’s it for: Gamers who play at small desks or entertainment centers. Wanting a desktop this small is certainly for a niche group of people out there. The 1.2-liter box is for the person who wants an ultra-clean desk or to hide their PC under an entertainment center. There’s definitely a ‘wow’ factor with the kind of performance Intel’s mini-PC achieves. Those high framerates come from the killer combination of the Core i7-8705G processor and AMD Radeon RX Vega graphics. By means of comparison, you should see framerates in-between a GTX 1050 Ti and a 1060. There’s one catch though with the NUC — it doesn’t come with RAM or a hard drive installed. That’s right, the already relatively high $740 starting price doesn’t come with necessary components for computing. Tinkerers will love that, but not everyone wants to buy a system that won’t work right out of the box. Why you should buy this: You want performance without breaking the bank. Who it’s for: Budget-minded gamers who want a slick gaming rig. Not everyone wants (or is able) to spend thousands on a gaming PC. 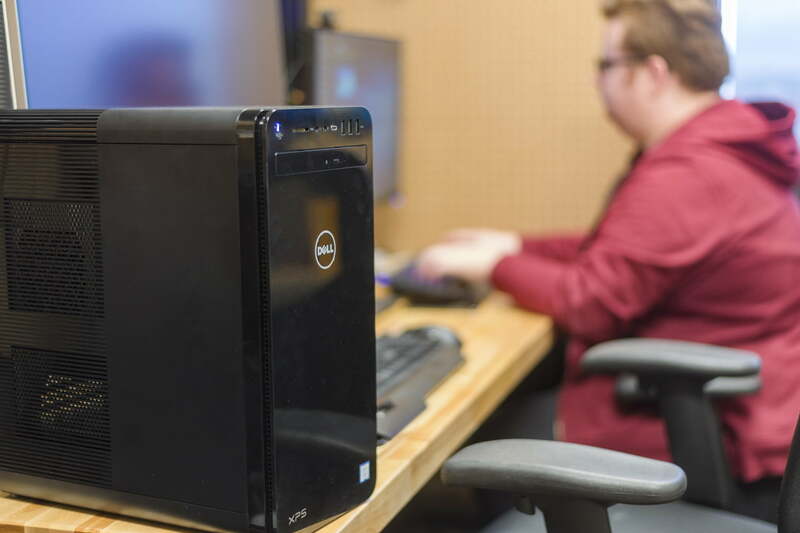 Luckily, there are potent options out there for even the most frugal gamers, and Dell’s Inspiron 5680 is at the top of the list. If you’re a fiend for gorgeous graphics, you can find better options, but few — if any — desktops offer the same level of power as the Inspiron for such a reasonable price. It’s best suited to 1080p resolution, but it’ll play demanding games like Battlefield 1 without breaking a sweat. In Battlefield 1, the Inspiron and its GTX 1060 never dipped far below 60 FPS at 1440p, even at ultra-high detail settings. To be fair though, our review unit wasn’t the basic $600 model, but a slightly upgraded one which retails for $1,100. Either way, it’s still an exceptionally capable machine at a bargain price. Dell also sells an AMD-powered version featuring up to an RX 570. The Dell Inspiron 5680 is a solid performer with a few drawbacks, but its low price and solid gaming performance make it a good choice, especially if you’re looking to step into the world of PC gaming for the first time. Why you should buy this: It’s a gaming PC in a professional chassis. Who it’s for: Professionals who like to game in the off hours on the same machine. Too often gaming systems seem tied into the idea of looking like a gaming system. Not every person who plays games wants their PC festooned with LEDs and aggressive styling. Even compared to the Dell Inspiron 5675, the 8930 has a button-up look that doesn’t draw much attention to itself. The Dell XPS 8930 packs all of the power of a gaming PC inside the chassis of an understated office machine. It wouldn’t look out of place hidden under a cubicle desk and yet it packs anything up to an 8th-generation Core i7, six-core CPU, 64GB of memory, and a GTX 1060. The review system we looked at was a little less powerful than that, but still a perfectly capable gaming system – especially when falling below $1,000. It’s not heavily customizable in other senses, although you can choose how much RAM and storage you want. But this isn’t a system that’s targeted at people who want a purpose-built RGB watercooling loop to be seen through their system’s side window. If you want to game, without overtly advertising yourself as a gamer, this system is a great choice. You might even be able to suggest this as your next office upgrade for a little gaming after hours. From the outside, no one will know it’s got some serious power under the hood. You’ve read our reviews. You’ve read our conclusions. And now you’re wondering how we came to them. Reviews often lack context. We’ll give out a score and analyze the finer points of desktop performance, but how do we reach those conclusions? How do we test these machines?